This is a great example showing how to connect the PMS-100 with TagoIO. This Sigfox board can be connected to a PC, Mac, Arduino, Raspberry PI, and other platforms. No coding is required to interface the PMS-100 with TagoIO! Just register the board in the Sigfox portal, create and configure a device, and upload the script in the Analysis. 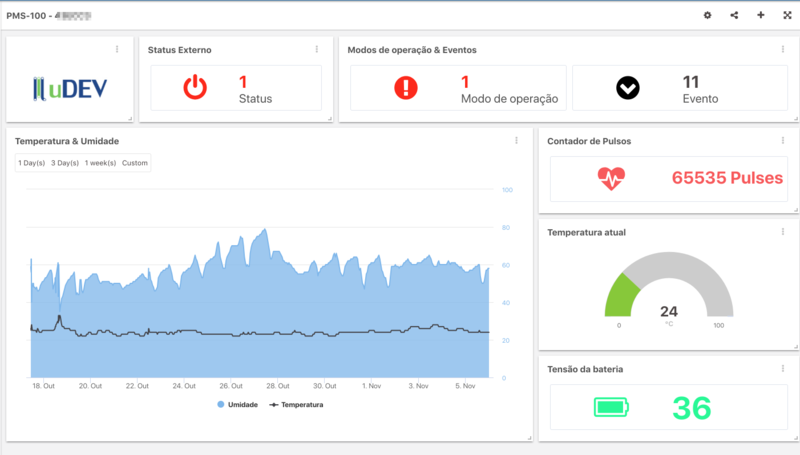 As soon as your PMS-100 starts to send data to TagoIO, it will be parsed and the sensor values will be showed in the dashboard. Follow these steps to interface PMS-100 with TagoIO and start to build your own application in minutes. Follow the installation guide from uDev here and prepare your PMS-100 to to send data. If you already added your device, configured uplink and downlink on Sigfox portal, please ignore the step 2. Follow the instructions on this link to create your device at TagoIO and to configure the callback on the Sigfox Portal. Make sure you create a device by filling the fields on the tab "Tokens" as described here. Check with your PMS-100 distributor about how to register the PMS-100 in the Sigfox Portal. a) Create an analysis that will parse the payload coming from the PMS-100 to extract the variables. b) Copy the code from parse_pms100.js. and click the tab Script and paste the code. c) Configure the "Time interval to run this script" as "Disabled". d) In the "Environmental variables", add the text "acc_token" in the variable key, and enter your account token in the variable value field. (account token is generated in the "My Account" > "Tokens" section). Create an Action, select "Action to be taken" as "Run Analysis" and select the analysis that you just created. In the tab "Trigger", select the variable "data" from the device you created. Select the options as showed in the figure below. Now, just turn your PMS-100 board on, and wait for the data to hit your data bucket! Every time the PMS-100 sends data, an action will be triggered and the script will parse the data sending to the bucket, ready to be showed in the widgets. You can start to build your dashboards immediately. Below, a real example of a dashboard displaying data from a PMS-100. Enjoy your PMS-100 with TagoIO!